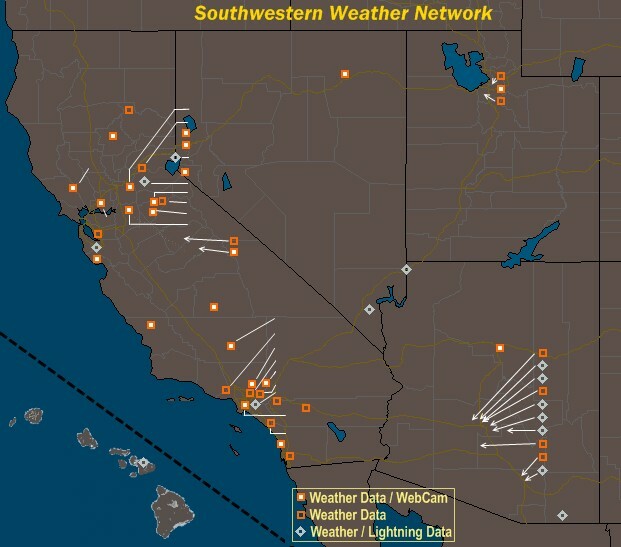 Each orange dot on the Sierra Nevada Mountains Live Current Weather Conditions Map represents an individual, private weather station location. The Weather Stations will not always line up with the town they represent. In other words, weather stations use the closest town name to their respective locations, and in some cases it is not very close. Click on an orange weather station dot to go to that weather stations home page. Pausing your curser over the weather stations orange dot location will expand the hidden slide out menu on the right, the menu offers considerable more weather information for the station, as well as more mapping tools. You can pin the hidden slide out menu to always be visible by clicking on the push pin icon on the lower right side of the menu. The wind direction arrows will only display if there is any wind to report. No wind equals no arrows. You can zoom in and out of the map. Once you have zoomed in, you can then select the hand icon (pan) to pan the map. You can view different Sierra Nevada rainfall amounts on the slide out menu as well as the Dew Point, Humidity & Humidex, exact Wind Direction and Speed, Wind Chill, Cloud Base, and the High and Low of the day. The temperature icons are color coded to the current temperature. You can view the temperature color chart in the menu.The sky icon represent the current sky. The barometric pressure icons show if the pressure in rising, falling, or steady. You can slow down the icon rotation or pause them in the slide out menu.